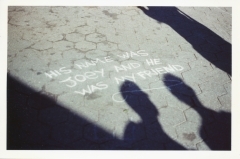 One of Javier's photos while we were in NYC around September 11, 2002. Taken at Union Square, NYC. We were performing in NYC in early September 2002. The aftermath of the World Trade Center destruction was very palpable in the streets and the year anniversary was very present in our experience.